Invite all Your Family and friends with this cute Disney Puppy Dog Pals Birthday Invitation featuring rolly, bingo, hissy, A.R.F., a fun and perfect invite for your little one’s animal themed birthday party. We have just opened up an etsy shop, If you would like to see our newest invites in etsy click the image above! Let ekwebdesigns Personalize this TuTu Cute Girl Baby Shower Invitation for your upcoming baby shower!This invite will be customized with your Party details. 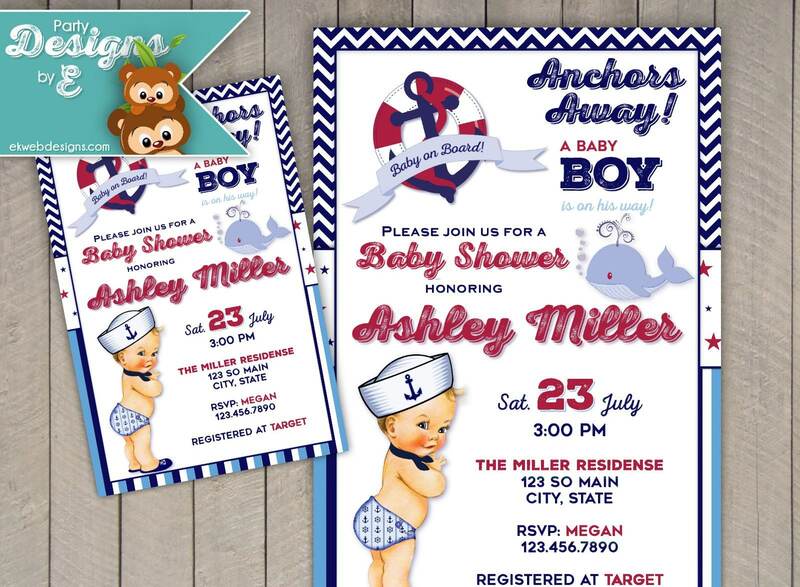 Let ekwebdesigns Personalize this Custom Little Sailor Boy Baby Shower Invitation – Anchors away Invite! Fresh new invitation for a fun sailor baby shower theme.This invite will be customized with your Party details. Let ekwebdesigns Personalize this Little Sailor Anchors away a baby boy is on the way! Fresh new invitation for a fun sailor baby shower theme.This invite will be customized with your Party details.This invite was options for skin tone and Hair Color!